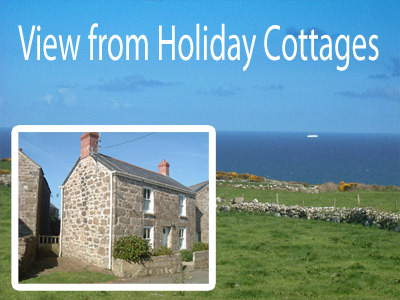 Traditional Cornish holiday cottages offering self-catering accommodation on the coast in the far West of Cornwall. Merthyr Farm Cottages are situated in the small village of Morvah midway between St Ives and Lands End and just off the glorious coastal road. They are individual properties of granite construction and look out over our fields towards the sea. They therefore enjoy both sea and rural views and are well appointed and comfortable..
Each Holiday property has a patio and a garden area with table and chairs. All the cottages (bar 1) have washing machines and all have clothes lines outside. Each Cottage has a television, DVD Player and a CD Radio. The kitchens are all electric with a full sized cooker, microwave, fridge freezer etc. We provide all kitchen utensils, cleaning materials and also tea towels. In the bedrooms we supply duvets and pillows but ask you to bring your own bed linen and towels. We offer both 2 and 4 bed cottages and a larger 3 bed (former) School sleeping from 2 – 8 people. The 2 bedroomed cottage has a double room and a twin bedded room (with 2'6" beds) and sleeps 2-4 people. The 3 bedroomed property is a very recent, stylish and spacious conversion of the former village school. It has a 2 double rooms and a further large bedroom with twin beds and bunk beds. It can accommodate up to 6 adults and 2 children. Please note the bedrooms are in separate areas of the building. The 4 bedroomed cottage has 2 double rooms, a twin bedded room and a 4th bedroom with bunk beds. It can accommodate up to 6 adults and 2 children. This district of Penwith has been designated as an Environmentally Sensitive Area and one of Outstanding Natural Beauty.The dramatic cliff scenery can be viewed from the Coastal Path, which crosses our land and can be easily reached by footpath down through our fields from the village. It is also a wonderful place to view one of our spectacular sunsets. Inland there are several lovely moorland walks and many interesting historical sites and stones to visit; the Men-an-Tol, Lanyon Quoit, Chun Castle and Chun Quoit all being within walking distance. Other local attractions include Cape Cornwall, Geevor and Levant Mines, Lands End and the many and varied attractions of St Ives. St Just, although smaller, also has a thriving art and craft community and a good selection of shops. 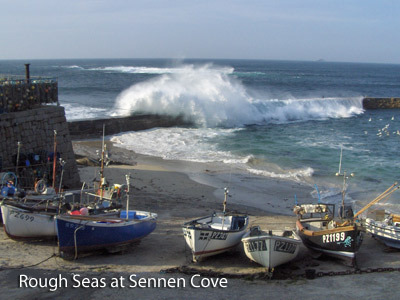 Sennen Cove is a very popular family beach as are the beaches in St Ives, where you can surf, swim or just sunbathe. Our local beach, Portheras Cove, is close by and is quite secluded and usually quiet. 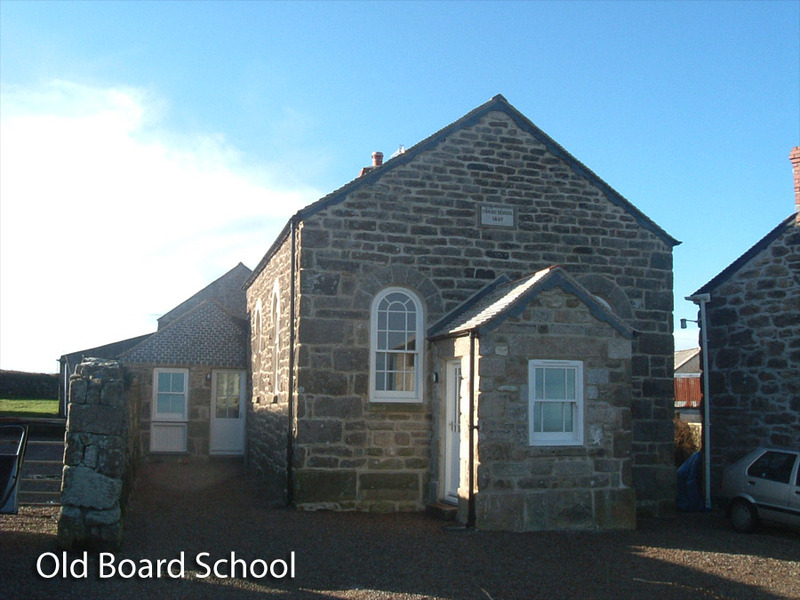 The Morvah Schoolhouse Gallery is just around the corner from the cottages and always has an interesting display of local arts and crafts as well as a little tearoom. Penzance is just 6 miles away on the south coast. The town is situated on the edge of Mounts Bay which is dominated by the magical St Michael's Mount. A visit here is a must – either on foot or by boat according to the tide. There are other National Trust Houses and some glorious gardens in the area. Merthyr Farm Cottages are really ideally situated for exploring the whole of West Cornwall and we look forward to welcoming you here!